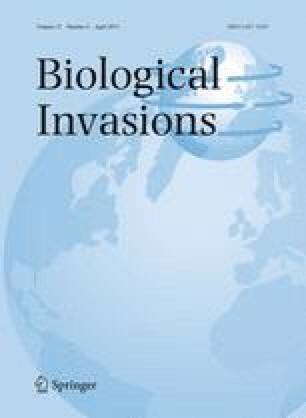 Invasive species are widely recognized as altering species and community dynamics, but their impacts on biogeochemical cycling and ecosystem processes are less understood. The emerald ash borer (Agrilus planipennis Fairmaire) is a phloem feeding beetle that was inadvertently introduced to the US in the 1990s and relies solely on ash trees (Fraxinus spp.) to complete its life cycle. Ash trees have a wide geographic distribution and are an important component of many different forest types in the US. The larval feeding behavior of the emerald ash borer (EAB) effectively girdles the tree’s phloem tissue resulting in tree mortality in as little as 2 years and stand mortality in as little as 5 years. Using the forest inventory and analysis database, we found that forest lands in the lower 48 states hold approximately 8.7 billion ash trees and saplings, which represent ~2.5 % of the aboveground forest carbon mass. Furthermore, we measured tree growth in 7 EAB impacted and 5 non-EAB impacted temperate forests in the Midwestern United States to quantify the impacts of EAB induced tree mortality on tree growth. We hypothesized that the initial C lost would be partly compensated for by the enhanced non-ash tree growth in EAB-impacted regions relative to non-EAB impacted regions. The EAB disturbance enhanced growth of non-ash trees in the EAB impacted region relative to the non-EAB impacted region. Results also indicate that in EAB impacted areas, growth of trees from the genera Acer and Ulmus responded most positively. Finally, we quantified annual biometric net primary productivity of the EAB impacted forests and compared these quantities to modeled growth of these forests in the absence of EAB and found that large scale ash tree mortality has reduced short term regional forest productivity. The loss of ash biometric net primary productivity is, in part compensated by enhanced growth of non-ash species. As expected, EAB disturbance severity was greater in forests with higher basal areas of ash. This study illustrates the ecosystem and regional scale impacts of invasive pest-induced disturbance on biogeochemical cycling and forest species composition. The authors would like to thank B. Long for establishing the plots in 2005, T. Fox, K. Costilow, L. Long, and S. Smith for their field assistance and Clifford Shirek for his assistance with production of Fig. 1. This research was supported by the National Science Foundation Grant DGE-0549245, “Landscape Ecological and Anthropogenic Processes”, the University of Illinois at Chicago (Hadley grant and Provost Fellowship), and the USFS NRS. We are grateful to three anonymous referees for their valuable contributions to the improvement of this manuscript.